An intense two-week, late-December trip to Israel/Palestine (the first segment visiting classic Israeli sites, the second as part of a synagogue-sponsored “listening tour” of Palestine) has left me with myriad impressions but one overall conviction. Like it or not—and I know many American Jews as well as Jewish Israelis do not—both the welfare and future of Israelis and Palestinians are indelibly linked. And the sooner the Jewish community recognizes the need for a common, dual stewardship of the Biblical Land, including both its human and physical resources, the better. Curiously, given the starkly different material conditions of the two groups, the mood among my Israeli conversation partners, including both government supporters and ardent critics, was notably darker and more pessimistic than among the Palestinians. Israelis, in short, appear to see little hope for a negotiated peace and anticipate another conflagration. The Israeli expectation of further bloodshed may, in part, be shaped by sharply reduced contact with Palestinians on a daily basis since the walls, fences, limits on Arab employment, and other separation measures took effect in the aftermath of the Second Intifada, 2000-2004. Our synagogue group’s comfortable stay in an East Jerusalem hotel and universally friendly reception while travelling through tourist-starved Hebron, Ramallah, Nablus, and Jenin thus notably conflicted with comments I’d heard the week before from Israelis who rarely ventured into any Arab neighborhoods. As for ordinary Palestinians I met, they seemed much less oriented or even interested in the larger political stalemate than coping with the hardships of daily life under Occupation. In the giant Deheishe refugee camp just outside Bethlehem, for example, where our synagogue group of twenty lodged for two nights in local households, the problems were manifold. On the first night, the electricity sputtered out twice during the course of dinner preparations, and the trickle of water into the building ran only-cold during most of my stay. Nidal, the father of my host family, had lost his Israeli job amidst the general clampdown on West Bank hires following the Second Intifada and had yet to find alternative employment; as a result, the family’s star pupil, their 18-year old daughter Haya, could not afford the $2000/year tuition to enter a local university. Yet, from their balcony, we could all see the bright lights of the Israeli hill-top settlement of Efrat, a luxurious abode that boasts large villas, tennis courts, and a heated swimming pool to attract American immigrants. In Jenin, where we subsequently stayed, as in Deheishe, local talk focused at once on the lack of jobs and the lack of freedom of movement imposed by a zigzag of security barriers and inaccessible highways built ostensibly to “protect” the 150 scattered Israeli settlements housing several hundred thousand residents. Unfortunately, what purportedly represents “security” and “separation” to Israelis is experienced by Palestinians as an intrusive disruption of economic and social life. 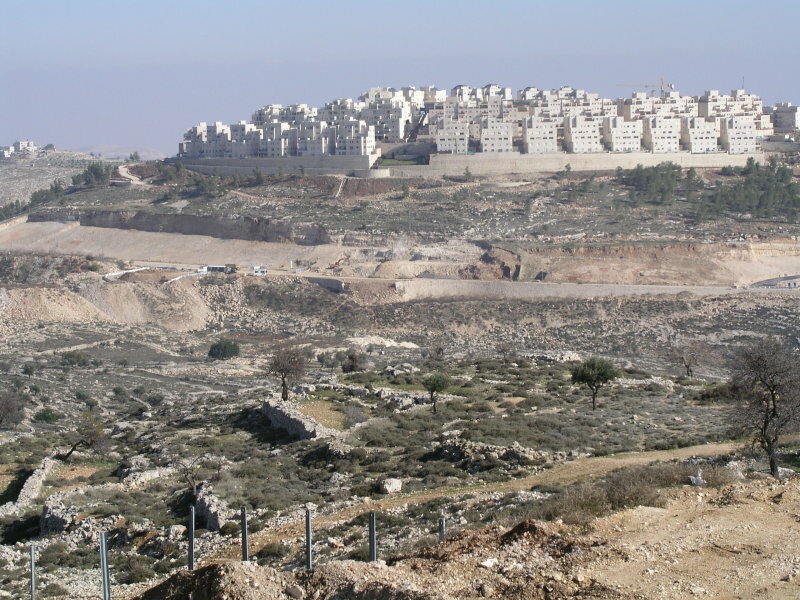 The supposedly “contiguous” settlements I had read about around Jerusalem proved something of a misnomer. Given desert ecology, human habitation, new and old in this part of the world, is centered on the hilltops, which makes, in fact, for discontinuous settlement pockets connected by limited-access security highways spread out through the arid valleys like forbidding fingers. One of my co-congregants reported a conversation with a 50-something year old man who spoke of his humiliation at being regularly strip-searched (and some days more than once) at the security checkpoints that dot the landscape and impede the journey to work. Indeed, even economic success stories in the West Bank suffer from the dark cloud of the Israeli security apparatus. At the Canaan Fair Trade facility in Jenin, for example, we witnessed a technologically sophisticated operation where area co-op farmers bring their olives to be pressed, stored, packaged and shipped and where their other products are prepared for export as well. Yet, the competitive position of the plant is endangered by cost and delays in the transportation network: not only do Jenin trucks have to negotiate unpredictable checkpoints but once arrived at the Israeli border, the “back to back” rules of Occupation require the shipping pallets (security concerns forbid the “containers” that everywhere else in the world dominate the transshipment of goods) to be broken down and transferred to Israeli trucks for ultimate delivery to the port of Haifa. Yet, for all their current woes (or perhaps because of them), Arabs on both sides of the Green Line appear to yearn desperately not for confrontation but some sort of accommodation with what is to them the Israeli colossus. Repeatedly, I heard condemnation of Israeli “oppression” mixed with admiration for the advanced economy and political democracy of their supposed antagonist. Similarly, when, amidst the gloom of the refugee camp, I asked Nidal what he would do if he could make decisions on behalf of the Palestinian people, his surprising answer was to “bring back the Israelis” to full control of the West Bank. As he explained, at the grassroots level, access to jobs and freedom of movement was “much better” before the Israelis responded to the Second Intifida with their policies of expedited settlements and enhanced separation of the two peoples. Overall, the situation presents the Jewish-American visitor with an ominous dichotomy. One quickly senses from observation of “the facts on the ground” that the practical chance for the much-vaunted “two-state” solution is running out. Clearly, that approach will only work to the extent that there exists the physical infra-structure for a viable Palestinian nation. Even then, viable independence will surely require close cooperation on matters of currency, trade, employment, as well as water rights. One might imagine that all those determined—for religious, psychological, military, or political reasons—to maintain a “Jewish democratic state” (that is with a Jewish majority population) would seize on this moment of relative Palestinian cooperation and quiescence to nail down a formal agreement while there is still time. The clear alternatives—pointed out over and over again by Israeli as well as Euro-American commentators—are either a permanent occupation state (a kind of regional apartheid) or a one-state democracy with an Arab-majority population. In the circumstances, the prevailing Israeli posture of hard-fisted government and a weary and cynical public augurs poorly for the strategy of further negotiations pursued by the Obama Administration and the larger international community. With or without political progress and with or without further conflagration, however, the “Palestinian problem” is not going away. However it is sliced and diced, the same piece of Biblical Land must ultimately provide adequate sustenance for two historic peoples. Is Israel listening? This entry was posted in Israel, JRC I/P Study Tour 2010, Palestine on January 4, 2011 by Rabbi Brant Rosen. Thank you so much for articulating your learnings while in the West Bank. This is invaluable in understanding the current situation. Thank you. Those of us who have not had this kind of exposure are indebted to you for your perceptions. Thanks for a balanced and compassionate summary of the current situation, so refreshing amid an abundance of extremist views coming from all directions!